Welcome to Buckeye Crating & Third Party Solutions. We specialize in packing and crating your most delicate and important possessions so that they can be shipped or moved anywhere in the world. We start from scratch, building a solution that's right for you. Shipping certain items without the right precautions can leave them damaged or destroyed. Even the most experienced movers can have an accident with your household items. Our professional staff has extensive experience building custom crates that eliminate worry. The crates are built with pressure treated wood and are made to withstand even the roughest shipping process. 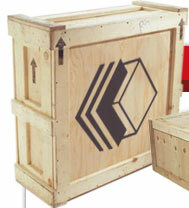 The customization of each crate maximizes the crates ability to cradle and secure the item. If you're a mover, and you work in or around Columbus, or a home owner who just wants to ship things right, we have the experience and industry knowledge to provide you with great crating and third party solutions. We offer: packing, unpacking, crating, light moving, maid services, disassembling, reassembling, and are internationally certified to meet European Union compliance standards. To learn more call and speak with one our representatives. our list, call to check services.